This is the official website of the FCSA UK, the only Home Office approved rifle club dedicated to the demanding sport of ultra long range (1000 to 1760 yard) competitive target shooting in the UK. We are the only UK rifle club that exclusively book military Field Firing areas (Live Firing Tactical training areas). We predominantly use bolt action .50 calibre (.50BMG) target rifles for long distance competitions, although we also compete with most smaller calibres at similar distances. We are also the only civilian rifle club in the UK with a MOD permission to regularly shoot historical large calibre rifles. With over 400 members we are now one of the fastest growing target shooting clubs in the UK. Range events and competition details can be found here, so if you already shoot target rifle but want to see what you can do at distances beyond the usual 1000 yards, then large calibre shooting might be the challenging sport you've been looking for. 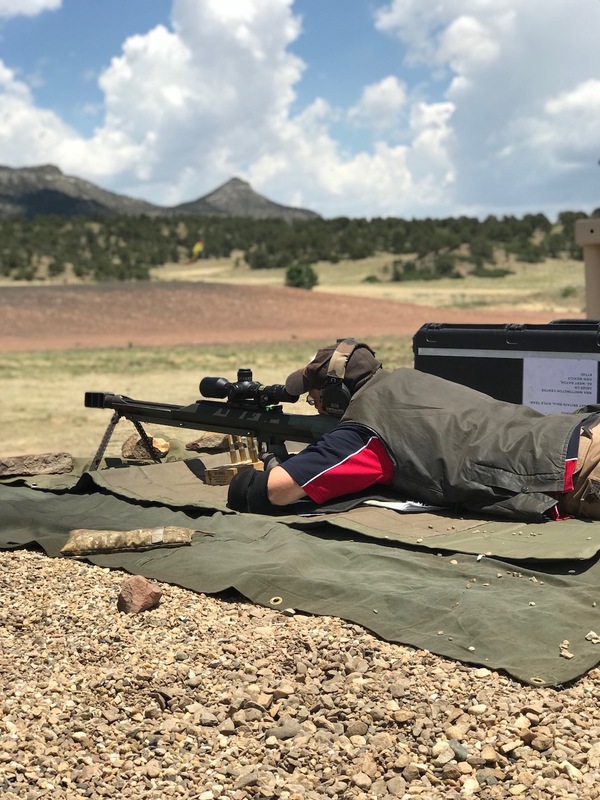 We are affiliated to the FCSA USA, and shoot the same competitions as our American counterparts, along with our own UK 'practical' competitions using reactive electronic targets which take full advantage of our unique UK military ranges. Some of our members also shoot in mainland Europe and annually compete at the World Championships in Raton, USA. We don't just shoot the venerable .50, all smaller calibres are welcome at our range bookings, even a .22RF will operate a figure 11 reactive target! Above: UK shooters competing in the 2018 World Championships, New Mexico. Large calibre rifles as used by Civilian Shooters in the UK are NOT 'Material Destruction Devices' as they are used with conventional ball ammunition, either lead core or bronze, to shoot paper or electronic targets, rather than explosive or armour piercing projectiles (both restricted as they are Section 5 in the UK) which are designed to damage a hard target at relatively short ranges and not designed for long range accuracy. Quite simply these are large target rifles. ONLY FCSA (UK) FULL MEMBERS ARE PERMITTED TO USE FULL POWER 50BMG RIFLES AT FCSA (UK) RANGE BOOKINGS. VISITORS, GUESTS AND ANY AFFILIATED MEMBERS ARE PROHIBITED FROM USING 50BMG RIFLES THAT GENERATE A MUZZLE ENERGY IN EXCESS OF 10,000 ft/lbs AT ANY FCSA (UK) RANGE BOOKING.